If you run your vCenter server and the associated database server virtually, you normally want to control on which host they are situated. Since vSphere 4.1 this is possible with the help of a feature called DRS Groups Managers. 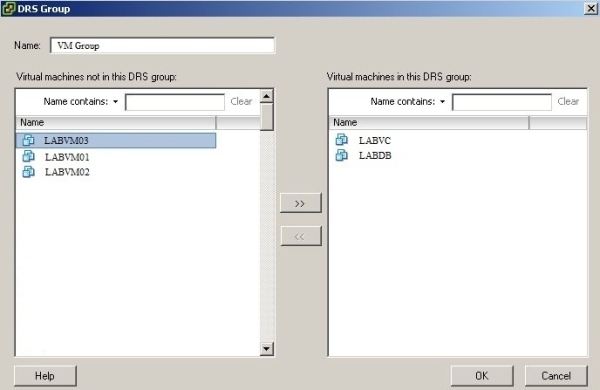 Right-click on the cluster – “edit settings”, and then in the newly opened window select the DRS groups manager. Now we have to create two DRS groups. One to contain the required virtual machines and a second with the dedicated host. In a last step these two groups are connected by a rule to cause the desired effect. In the next step we will create a rule to connect the two groups – to do so select “Add” in the section “Rules”. 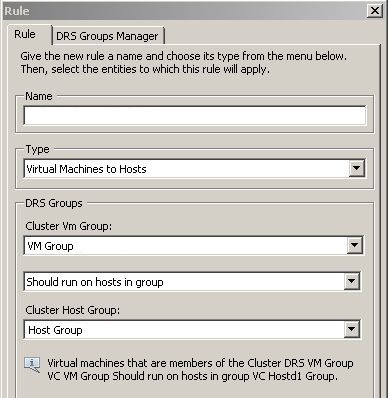 Assign a name for the rule and select the groups defined in the steps before in the fields “cluster VM group” and “cluster host group”. 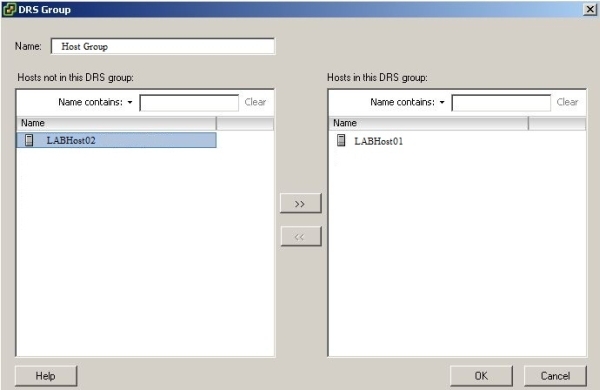 Because we want our VMs running on the ESXi host which is defined in the “host DRS group” there is only the choice between “should run on hosts in the group” and “must run on hosts in the group”. For “must run on hosts in the group” the rule is enforced as hard as nails – and HA not departs from it. So if we choose “Must run” and the host fails, the affected VMs can not be started by HA on a different host in the cluster. 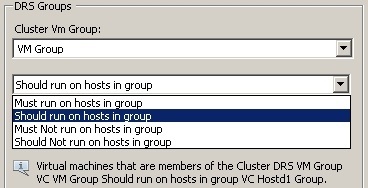 Is “Should run on hosts in group” selected, HA will differ from the rule and try to restart the VMs on another ESXi host. Once the failed host is available again DRS (if enabled) will migrate the VMs back to the desired host to meet our rule. From now the two VMs will run on the selected host as long as it is available. If it fails HA will ensure that the VMs are restarted on another host and hrough DRS the VMs will be migrated back when the host is available again.